Honeycomb Reef Worms: What Are They? Tropical corals are not the only species which are able to change their environment via their own physical structure. In fact a large variety of species are capable of building what are known as biogenic structures (or bioconstructions). By definition, reefs are solid, massive structures which are created by an accumulation of organisms, often emerging from the - either rocky or soft- substrate, and which form a separate habitat that is clearly distinct from the surrounding sediment. A reef structure can be composed almost exclusively of the organism and its tube or shell, or, to a certain extent, can de made up of sediment, gravel and shell debris which have been bound together by the organism. It is not always easy to distinguish between a reef and a large gathering of individual organisms. Gregarious tube-dwelling polychaetes (or marine worms) represent the single largest taxonomic group capable of bioconstructions. This is particularly the case for the Sabellariidae (Johnston, 1865) family, which contains 19 genera, of which some such as Idanthyrsus (Kinberg, 1876), Phragmatopoma (Mörch, 1863) or Sabellaria (Savigny, 1818) are capable of building reefs which stretch over several dozen kilometres along the shore. At a global scale, the largest bioconstructions can be found on the coast of South America for the species Phragmatopoma lapidosa (Kinberg, 1866), and on the coasts of Europe for Sabellaria alveolata (Linnaeus, 1767). (2) Sabellaria alveolata is found mainly on the bottom third or so of the shoreline and in the shallow subtidal, and whose bioconstructions can take on several different forms depending on local environmental conditions. 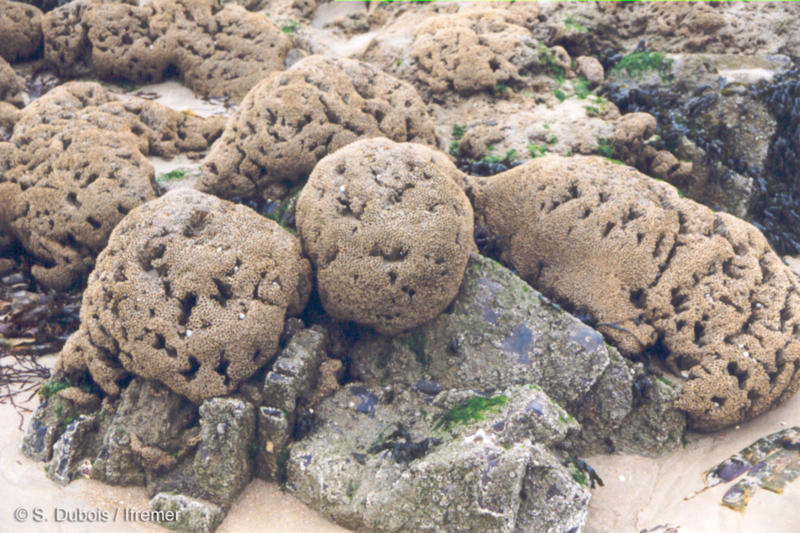 Typically, S. alveolata is found along rocky shorelines at the level of the fucoid belt, where tube agglomerations can range from thin crusts or veneers over the rock when they are present in low numbers, to dense hummocks and mounds when their density is high. A Sabellaria alveolata bioconstruction on a rocky headland on the Normandy beaches. 19th century naturalists described them as follows: "On these shores so violently beaten by the waves, one encounters sometimes behind a large rock, sometimes inside a deep cleft, but also often on some entirely exposed headland, large clods of sand studded with an infinity of small openings half-covered by thin ridges. Each of these clods, which are similar in appearance to beehives, are either villages or dense metropoles. For here live hundreds of cloistered honeycomb worms, the most curious of tube-dwelling annelids that the naturalist may observe." (A. de Quatrefages, 1854. Souvenir d’un naturaliste, Tome 2, p180). French naturalists called these annelids "Hermelles" as they used to belong to the Hermellidae family, now redefined and split into several families, including the Sabellariidae to which Sabellaria alveolata belongs. The word "Hermelle" is still the common vernacular name in France. Depending on the regions in France, honeycomb worms are referred to with other colourful names. For example, in the Mont-Saint-Michel bay, honeycomb worm reefs are commonly referred to as "crassiers", which roughly translates as "dirty encrusters", as until recently they were perceived as little more than a nuisance to shellfish farming.